FSU Art Faculty Kevin Curry exhibited Six of one, half a dozen of the other featuring a selection of Idea Fund supported projects. The Idea Fund is a re-granting program established by The Andy Warhol Foundation and administered by a partnership of DiverseWorks, Aurora Picture Show, and Project Row Houses. 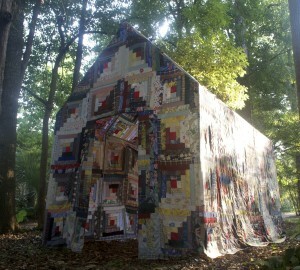 Housewarming is an oversized quilt tailored to be a metaphorical and physical embracing of the present by the past. The piece has evolved over time into an installation replicating the cabin that Henry David Thoreau built at Walden Pond – becoming a place of respite and contemplation for both the artist and audience.